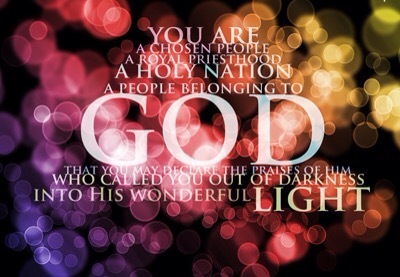 The Lord has called us at such a time as this to be a royal priesthood. We have been called to be representatives of The Kingdom of God. He has called you amongst others to minister The Word of Truth. He has called us all to worship and serve Him in Spirit, and in Truth. Remember many are called, but few are chosen. Put on the garment of holiness, righteousness, and praise. It is when we portray the glory of The Lord that He makes our lives beautiful. He has consecrated us with His Blood, and made us brand new with His awesome love. He has filled us with precious spiritual gifts, and has empowered us all with wisdom. 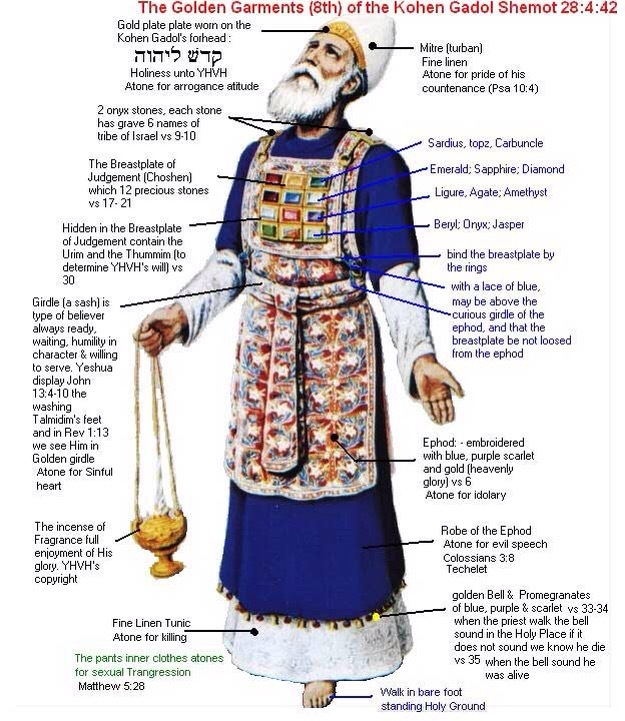 An ephod is a sleeveless garment I imagine that it is like a vest underneath the breastplate. Jesus has made us whole. He says that we must guard our hearts, and bury His Word in our hearts. Just like the Ephod is underneath the breastplate so is His Word buried in our hearts, The Shield, Strong Tower, and covering of our lives. His Word protects, His Love shields. You see before Jesus died on the cross so that we could receive eternal life, we were condemned, but Jesus took away our Shane, our guilt, our pain and now there is no condemnation in Christ Jesus we have been set free. Jesus acts as a mediator constantly interceding on our behalves. So what Aaron was doing was a prophetic act. Yes we will all still stand before our Maker one day and receive judgement, but God is willing to forgive us of our sins if only we repent and Jesus is constantly interceding for us. We thank God for grace, it is sufficient enough for us all. For everyone that ministers the Word of Truth please meditate on Exodus 28:35. When you minister, when you preach, when you pray, when you worship your voice shall reach the heavens. What you minister shall be a sweet sound in His Ear, and you shall not grow faint not weary. You shall live and not die. You shall live to proclaim The Word of God. Our God is Holy, and that is why we must strive for holiness also. We must be a living sacrifice to The Lord, holy and acceptable. Exodus 28 teaches me that God is a God of order, God is Holy, and He is a God of purpose. Exodus 28 also gives us a glimpse of what it is to be holy. Holiness takes sacrifice, but it brings glory to The Lord, and bringing glory to The Lord beautifies our lives. 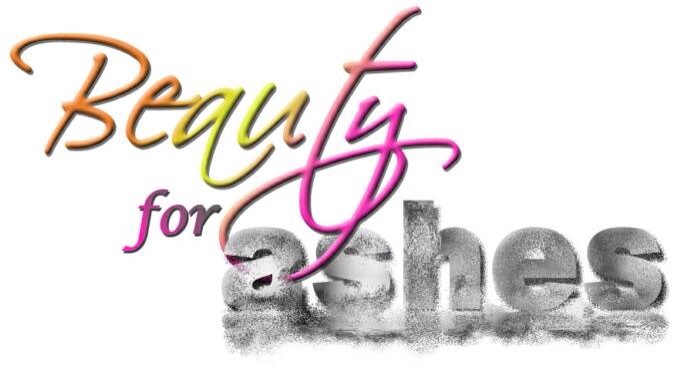 All the beautiful colours that God instructs His children to use are purposeful, and prophetic. Scarlet red representing The Blood of Jesus, purple representing royalty we are a royal priesthood Jesus is The King of kings, and heaven the streets are paved with gold. All these colours must be intricately woven together, and it is not just by chance! God is a God of detail, and is the best designer. I have read this scripture before and I did not get this revelation. I thought it was just about priests and I found it boring. The book of Exodus is prophetic. Whatever offering you give to The Lord be rest assured that it is going to God and not to man. Whatever you give you shall receive back. Let your offering, your sacrifice, your worship bless the Lord. You shall receive them back from their hands and burn them on the altar as a burnt offering, as a sweet aroma before the LORD. Before Christ tore the veil, only few were able to dwell in the presence of God. and only few were able to feast at the table of The Lord. When Jesus tore the veil He set us free, and made a way for us to become priests, in fact believers are a royal priesthood. Now just like Aaron and his sons we are also able to feast at the table of The Lord, because of the sacrifice that Jesus made we can eat of His Body, and we can drink of His Blood. And you shall offer a bull every day as a sin offering for atonement. We ought to be forever grateful and thankful to God for giving us His son. He became the atonement for our sins. We have to understand that if it wasn’t for the price that Jesus paid for our sins most of us would pretty much be dead, because if we dared to even go near His presence knowing that we have sinned we would not have been pardoned. So we thank God for His Mercy, His Grace, His Sacrifice, and His Loving Kindness. His Blood sanctified us and has made us whole. Nothing but the Blood of Jesus can wash away our sins. 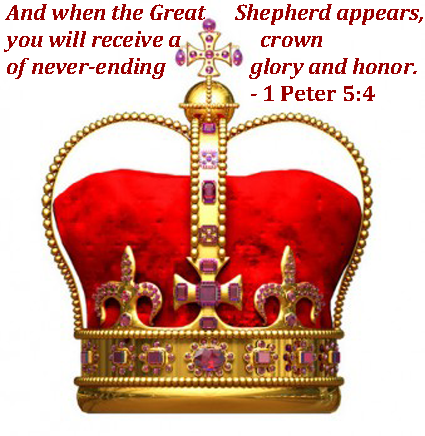 We have become a royal priesthood, therefore we are anointed and sanctified. Those that dwell in His presence are able to minister with power! That is why it is good for believers to pray and fast. Put on the full garment of The Lord. His presence shall go with you and wherever you go His presence shall leave a sweet scent, a refreshing aroma. Finally He shall anoint our head with Oil, and our cup shall run over. We have become the sanctuary, the Holy temple in which He dwells. That is why it is important that we do not fill ourselves with rubbish. We are a royal priesthood,and royals do not fill themselves with rubbish they only fill themselves with the best,they are robed in the best. Therefore lets fill ourselves with the best which is His Word Spirit and Truth, not flesh and lies. Put on His full garment and get rid of everything that is not of Him. Fill yourselves with love not hate, forgiveness not bitterness, purity not lust. We cannot worship The Lord in Spirit and in Truth if our hearts are not right. We cannot minister with power if we are not consecrated in His Word, because it is His Word that anoints us. Be a living testimony, be the place where God dwells, strive for righteousness, purity, and holiness. I pray that our lives will give glory to God. Repent and turn away from sin, get your heart right with God, renew your mind, and put on the full Garment of The Lord. Your cup shall never run dry. 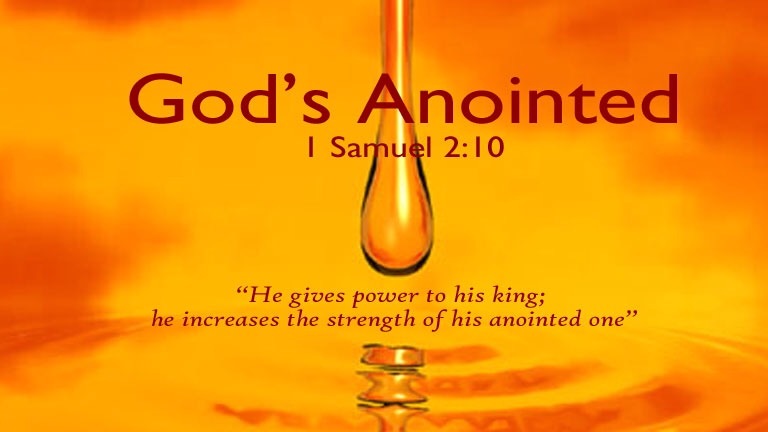 I pray that The Lord shall continue to anoint our generation with His Holy, Sanctified, and Consecrated Oil. The Lord wants your attention and He will surely get it. Wow thank you ma! I’m honoured to receive such encouraging words, we thank God for His Word.